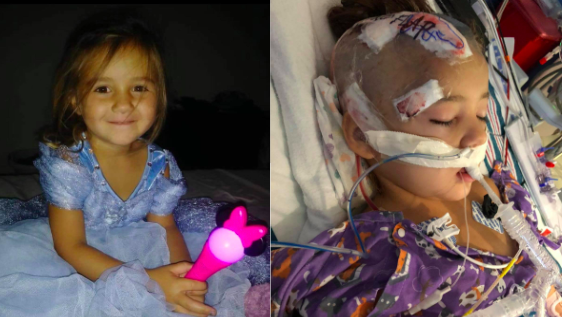 Three-year-old Preslie Jenkins was shot in the head at the end of October during what her mother calls a "random act of road rage," and it wasn't clear if she was going to survive. But the little fighter did survive — and she's even walking again, with a bit of help. Preslie's mom Nikki Jenkins told CBS News that her daughter was shot early on the morning of October 28 in Port St. Lucie, Florida, while the family was on their way back from babysitting a friend's children. While the family was driving, a man "flew up" behind the family's truck. Nikki says the man sped up and shot once at the vehicle at an angle, in an act of road rage. The single shot hit little Preslie right above the eyebrow. The bullet exited out of the top of her head, Nikki says, "completely through." Preslie was airlifted to St. Mary's Medical Center in West Palm Beach, Florida. She was in surgery for about six and a half hours, Nikki says. "I was hysterical, I was out of control," Nikki told CBS News, "They told us that they had to remove part of her brain and her skull." Preslie was in a medically-induced coma for about two weeks, says Nikki, but is now in rehab. "Thankfully God protected her. Honestly, I think it was just the power of her," Nikki said of her daughter. Police are still looking for the suspect. Nikki said, "I just can't see how he can live with himself." The Port St. Lucie Police Department posted on Facebook regarding the incident on October 30, describing the suspect as "possibly a Hispanic or light skinned black male" driving a "black, newer model, 4 door sedan." In the little more than five weeks since the incident, Preslie has been speaking and has even begun to walk, with assistance, improving with each attempt while in rehab. Erin MacPherson, a reporter for CBS affiliate WPEC-TV in West Palm Beach, Florida, tweeted a video of Preslie walking Monday. But the family isn't out of the woods yet. Nikki says doctors want to keep her under supervision for "at least four more weeks," but they say "she's doing amazing and should make a full recovery. There's little things we may notice but maybe not." Preslie is expected to get braces for her legs to help her walk, and she will also receive skull implants when the swelling has gone down on her brain. Nikki says the implants are $30,000 and that "every little bit, we're kind of just saving right now." She has not been able to return to work, though, and the medical bills are increasing with time. Thankfully, Nikki says the community has rallied around the family, helping organize fundraisers to help with medical costs and whatever they may need. A friend created the hashtag #PreslieStrong and merchandise is being sold to help raise money for the family. A friend also created a GoFundMe for Preslie, which has raised $14,500 of its $20,000 goal. Nikki says her PayPal is also open for donations. "It's had a major effect on our life," says Nikki, "It's changed everything. Emotions I never wanted to feel. I can't even put into words. I just want my baby back — dancing around and okay."